You can use your Freedom Pass as soon as you receive it. Please destroy any previous pass you may have. Using your Freedom Pass is straightforward. 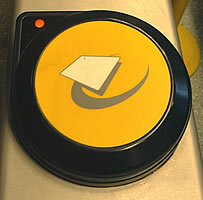 On the gates at most stations and when boarding buses you will see a yellow circle which is a card reader. Keep your pass in its wallet and touch the pass flat onto the yellow card reader. On buses with more than one entry door you must touch your card on a reader at the earliest opportunity. 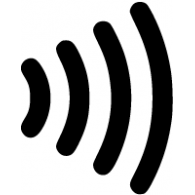 If you have a Freedom Pass and a contactless payment card that displays the symbol below, make sure you keep your contactless payment card separate from your Freedom Pass. If you touch a purse or wallet containing your Freedom Pass and a contactless payment card onto a yellow reader, the reader may charge your payment card for the journey rather than recognising your Freedom Pass. If the reader detects more than one card, neither will be read and at stations, the ticket gate may not open. If you have a valid Freedom Pass and have been charged a fare on your contactless payment card, please contact TfL Customer Services on 0343 222 1234 (Local call charges) to apply for a refund. You will need to advise them of your Freedom Pass number, name and bank account details. Visit www.tfl.gov.uk/corporate/publications-and-reports/contactless-payment or more information on contactless payment cards. Keep your card in its protective wallet - remember you don’t need to take your pass out of the wallet to use it. Take care not to bend or scratch your pass or write anything on it. Keep your pass away from your mobile phone/pager or anything electronic. Be careful to keep your pass away from coins, studs and zippers as they will scratch it. Don’t keep your card in your back pocket as it will get damaged if you sit on it. Do not insert your card into the ticket slot on Tube or National Rail Stations. Up to four children aged under 11 may travel free with a Freedom Pass holder on all buses, trams, Tube, DLR and between stations on the orange routes on National Rail/London Overground services as per the Freedom Pass map. Please do not lend your pass to friends or relatives. The Freedom Pass is only to be used by the authorised holder. For more information, please read the conditions of use below. 1. The Freedom Pass is issued subject to the operator's Conditions of Carriage. Please contact the relevant operator for a copy of their up to date conditions. 2. The Freedom Pass remains the property of London Councils and is not transferable. It may only be used by the holder whose name appears on the front and may not be used by anyone else. 3. The Freedom Pass must be shown to ticket checking staff. It must be produced for inspection on each journey on demand. 4. The Freedom Pass is not valid if illegible, damaged or altered. Ticket checking staff may withdraw any pass which appears to be invalid or is being used incorrectly. 5. The Freedom Pass is available for free or reduced fare travel only at the times and on the services shown on this site and in the leaflet issued with it or in other notices. 6. All services and timetables are subject to alteration without notice. 8. Freedom Pass data will be provided to the Audit Commission for the National Fraud Initiative and will be used for cross-system and cross authority comparison for the prevention and detection of fraud. The Freedom Pass is the 'travel permit' for the purposes of the Greater London Authority Act 1999 and the Concessionary Bus Travel Act 2007. The scheme is managed by London Councils on behalf of all the London boroughs.